Asking 'what if?' 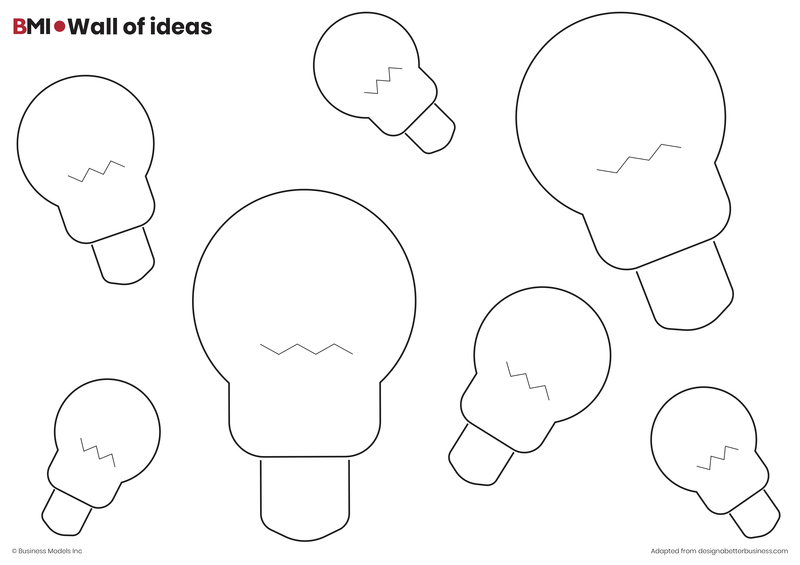 is a powerful way to fill a wall with great ideas. Feel free to use these trigger questions, or create your own! Ask the trigger questions to your team in a fast pace, challenging each person to create lots of ideas. The wall of ideas is a great way to record the results of your ideation session. Asking them trigger questions as they fasten their sticky notes to the wall is a great way to get everyone, from the introverts to the extroverts, working together creatively and feeling a sense of achievement. As each team member adds ideas to the wall, the rest of the team will no doubt come up with new ones or point out ones that are funny or interesting. The wall of ideas requires preparation. First, decide on a list of trigger questions that you’re going to ask the team in rapid succession (one every 30 seconds or so). Below there is a list of trigger questions we like to ask. Good trigger questions help you make new connections and help you to think in a ‘what if’ mindset. The questions are geared towards the Business Model Canvas, but it is perfectly possible to make trigger questions to help for instance your customer journey, persona, or vision. The process will be the same, and it will help you come up with a lot of options. You’ll probably need around 20-40 questions at least. Use your existing business model canvas as fodder for creating new questions. If, for instance, you sell a product today through retailers, what would happen if you sold it directly to customers through an online channel? What would that look like? You get the picture. What if… you stopped selling your #1 product or service? What if… you offered it for free? What if… you turned your product into a service? What if… you sold it only online (or offline)? What if… you used a subscription model? What if… you used a bait and hook model? What if.. you offered a freemium model? What if… your offering was a B2B or B2C only? What if.. you could eliminate your fixed costs? What would Richard Brandson do? What would your scariest competitor do? Have the team members sit individually, with a stack of empty post-its and a good marker. Explain that when the exercise starts, you will ask a question every 10-15 seconds or so. They should write down everything that they think of, and fill as many post its as possible. At this stage, there are no bad ideas. Every idea is a stepping stone that leads you to the next. As the trigger questions are asked, each person will simply write whatever comes to mind on a sticky note using a permanent marker. By the end of this exercise, there should be a pile of at least as many sticky notes as there are questions in front of each participant. Once the questions run out, have everyone affix their sticky notes to the wall, one at a time, calling out the idea, so everyone is clear about what’s been added. Don’t worry about the organization at first. There will be way too many ideas on the wall to make sense of, so the next step is, to organize the ideas into a maximum of 5 high-level clusters. You can define the clusters beforehand, or you can use affinity mapping and let them emerge. Have the team members work on the clustering together, and prompt them to ask each other what they meant with certain ideas. Of course, it is okay to add new ideas! When you’re done clustering, record your result. Photos make it easy to do that. Send them around to the team and don’t forget to keep them informed of future progress! Try to define experiments to validate new ideas and see which ones resonate.